Quilt size 56" x 76"
Wanted to mention, this quilt would lend well to scraps you already have. Feel free to mix and match what you have, you will just need it is the amounts listed above. Email us with any questions! 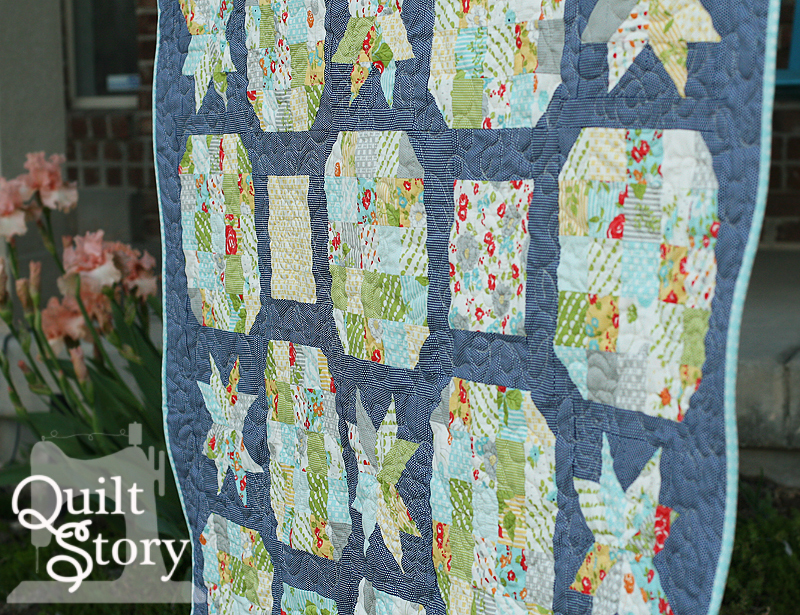 Christa Quilts still has some Lucky Stars Starter Kits for those of you wishing to quilt along. Each kit contains 1 Jelly Roll plus 1 Layer Cake of Happy Go Lucky by Bonnie and Camille. She's offering them at a special price of just $74.95 which includes free US shipping (discounted int'l shipping)! On top of that, use code STORY at checkout to save an extra 10% on your entire order so that you can purchase background fabric or other supplies. 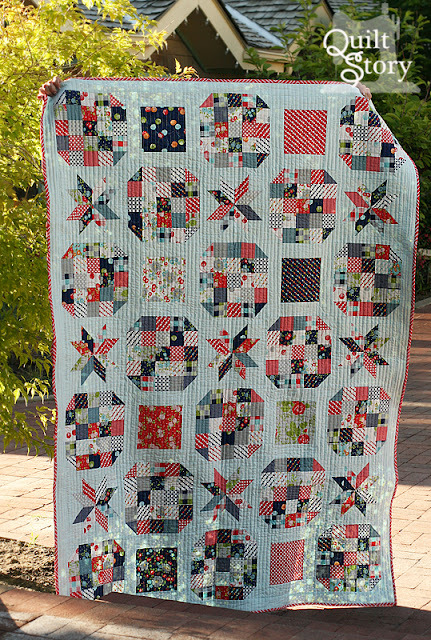 And I dare you to imagine this quilt in your scraps! You certainly do not have to use the new Happy Go Lucky line! This pattern totally lends itself to a scrap quilt! Use up all those extra HST's from the last quilt you made :) It'll be fun! Anyone who finishes their quilt top is entered to win a prize from the following shops. There are 8 different shops with $50 prizes. Gasp! I don't have a jellyroll or charm pack, so I was hoping to use existing fabric in my collection. Do you have a suggestion for how many different prints I should cut from? Do the 30 strips need to be 30 different fabrics or do you think it would be okay to get six strips from five fabrics? I don't know if I'll be able to actually participate in the quiltalong (first priority is a baby quilt for babe due in Sept) but I adore this quilt and have the perfect fabric in mind. Can you tell me the dimensions? I'll want to make my quilt a bit bigger (for picnics/firework watching with kiddos) and need to figure out how much extra fabric to buy or if a jelly roll/cake will be enough to make it a little bigger. Also--how long will the quiltalong run? Thanks!!! Looks Like Fun. Im Going To Follow Along At A Slower Pace. Plus I Love Making Quilt Topper. How Big Is This One Going To Be With The Amount Of Fabric YouListed? Could I use charm packs instead of the jelly roll for this? I'm looking forward to start!!!! so much fun....can't wait to get started! I have a jellyroll I want to use for this so I will have to get hunting for some matching layer cake sheets and the rest. Excited! I am thinking to quilt along scrappy style! Great design. So I am going to use some FQ I already had, but ordered the coordinating jelly roll of Lotta Jansdotter - I'll still need to decide on a background color. Maybe I don't need to decide that yet? I hope not, I have bolts of white and black, I will have to buy if I'm using another color and I wold like to see one of my blocks made first. Decisions decisions. I will be using fabric from my stash. Fun,fun,fun, love quilt along.